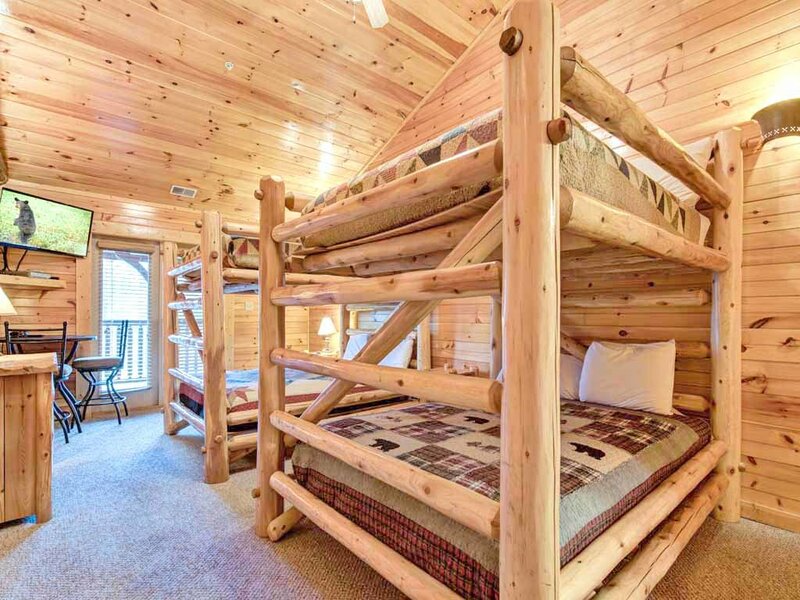 At Pine Tree Lodge, three’s not a crowd—nor is thirty-six. 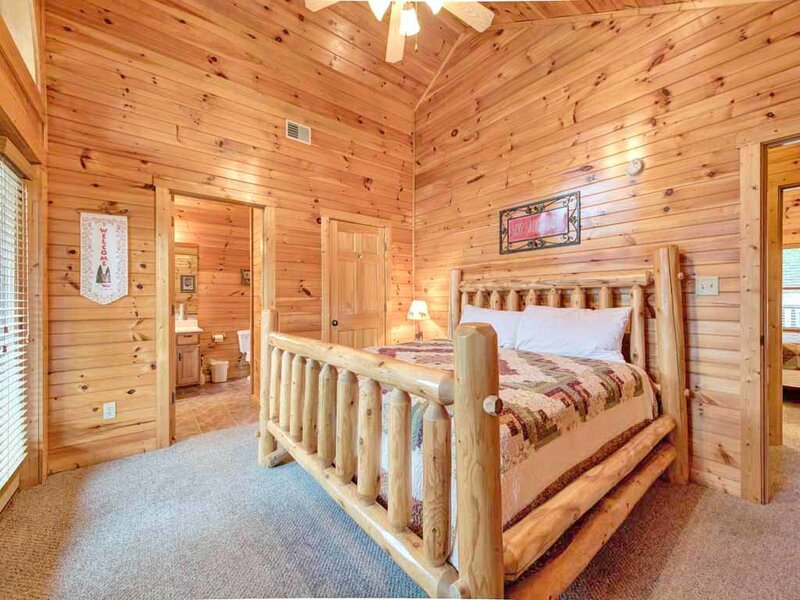 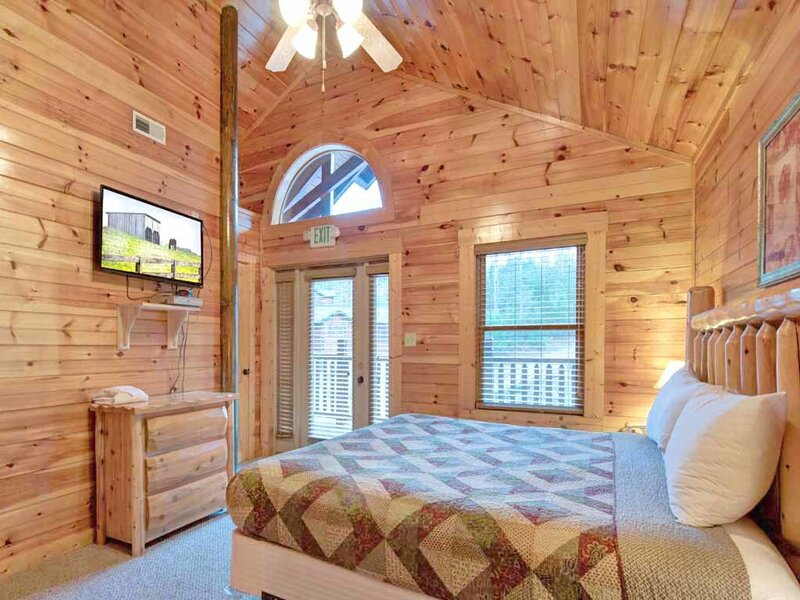 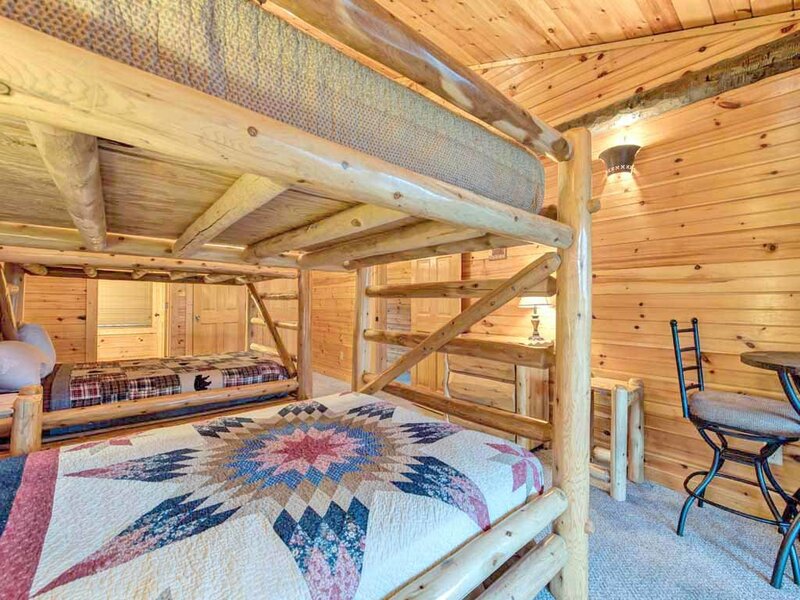 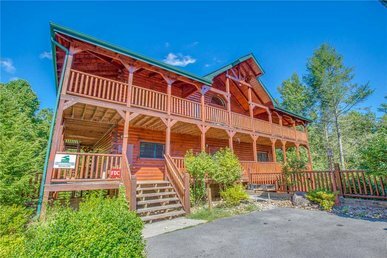 Yes, this huge three-story log home can sleep up to thirty-six people in its eight bedrooms, each of which has its own private bathroom. 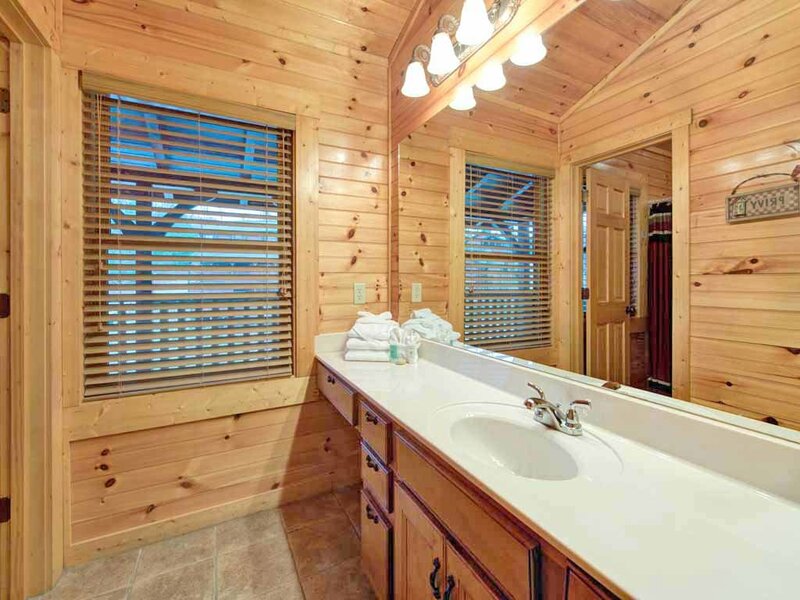 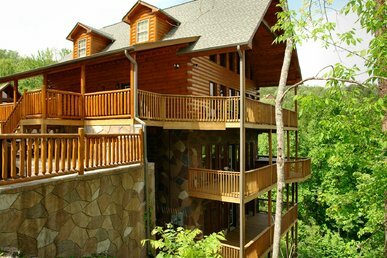 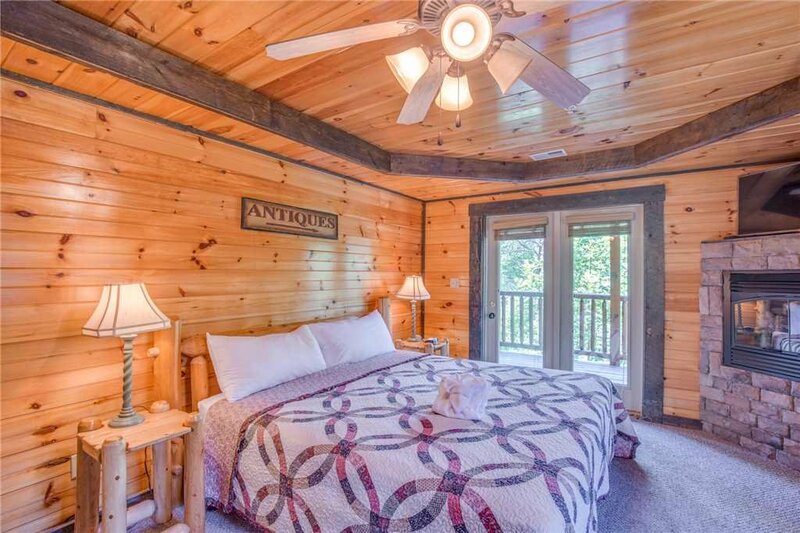 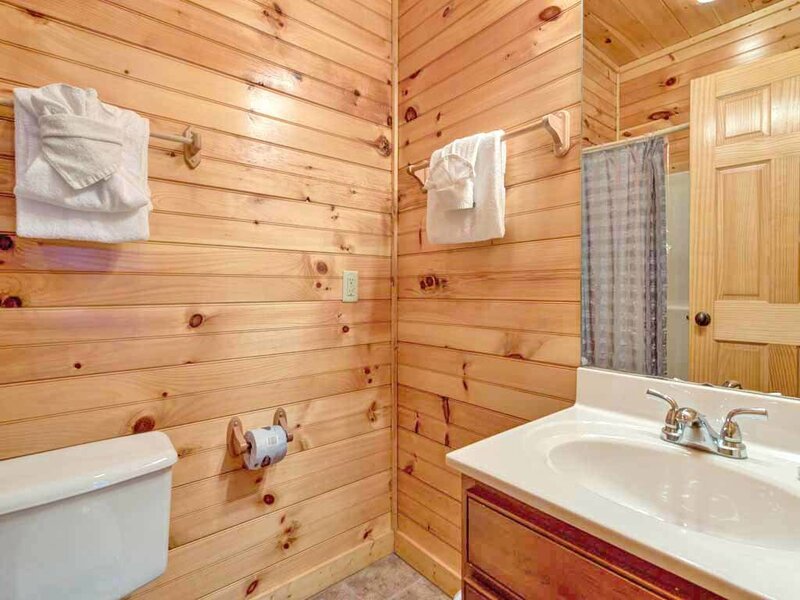 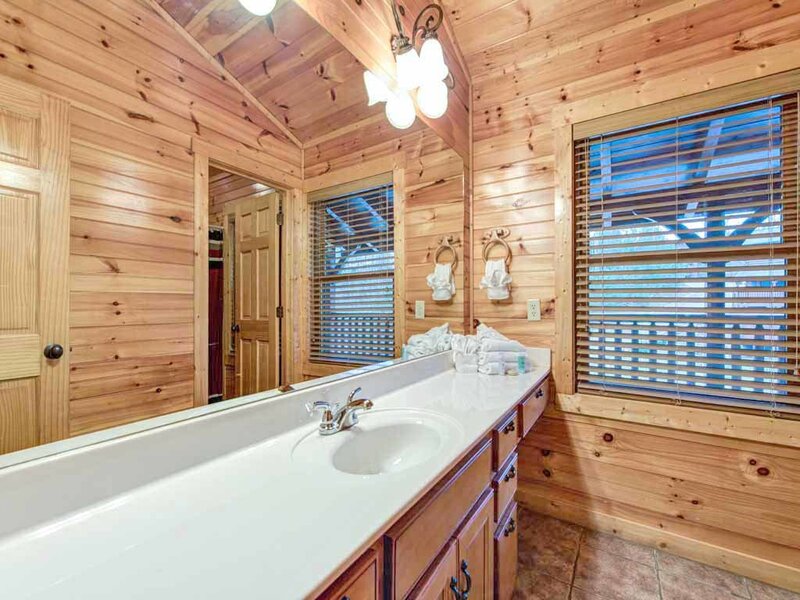 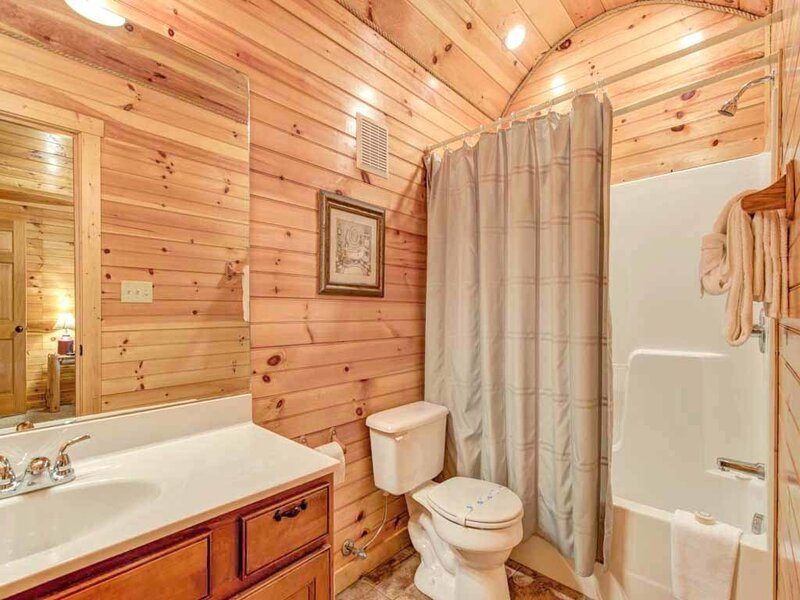 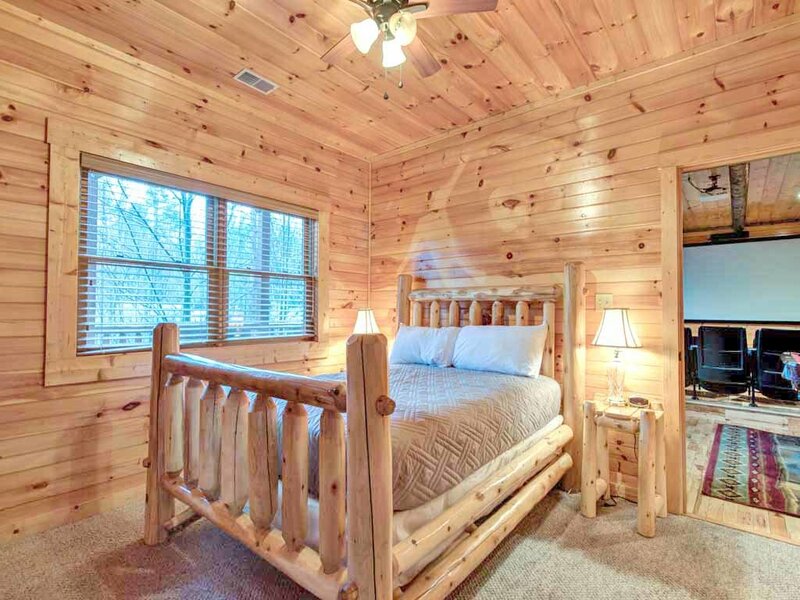 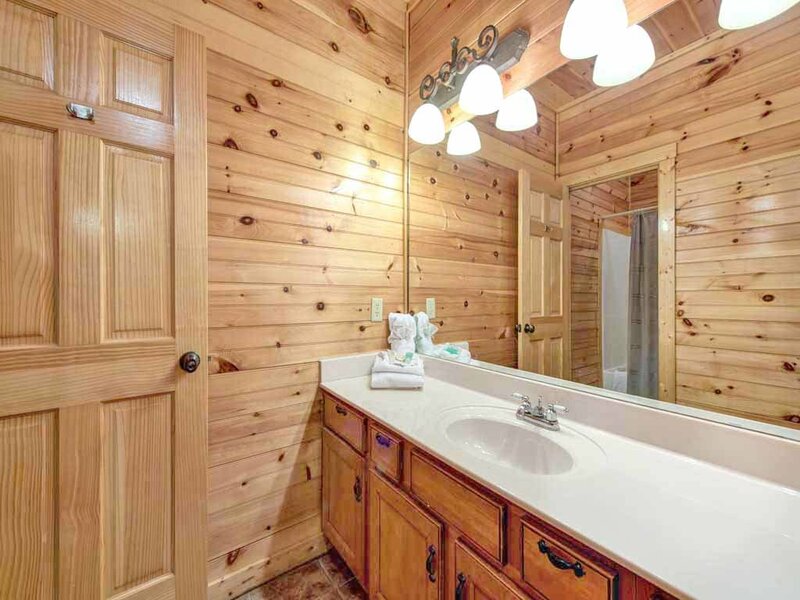 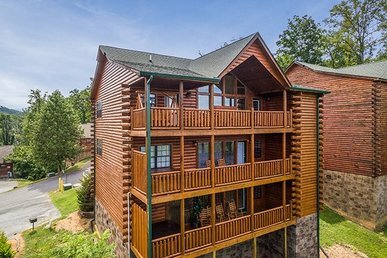 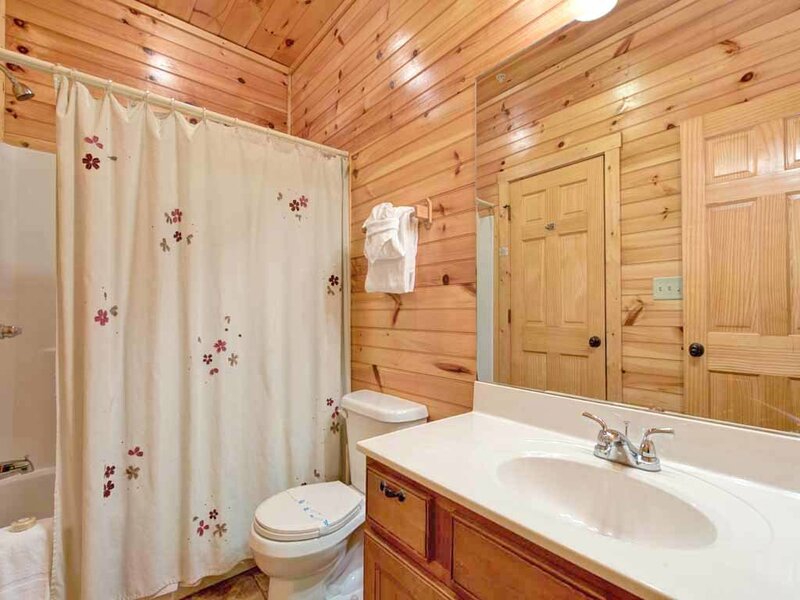 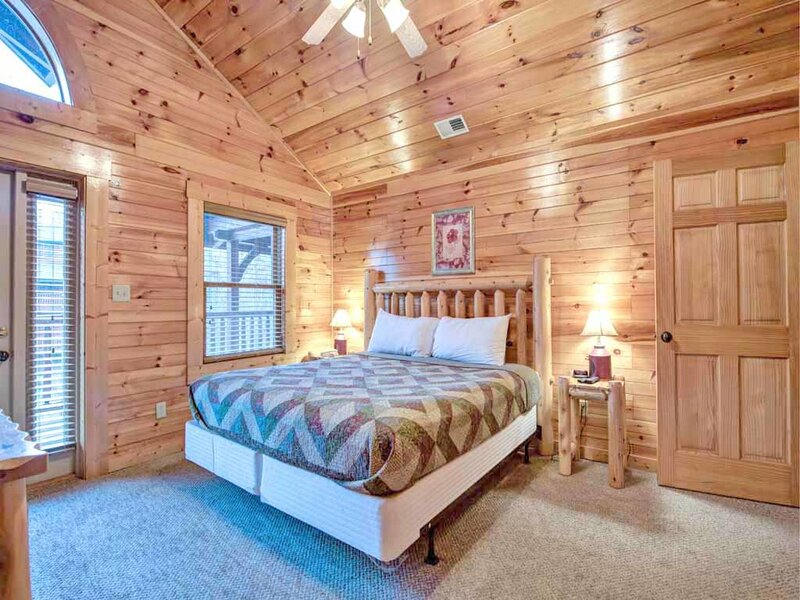 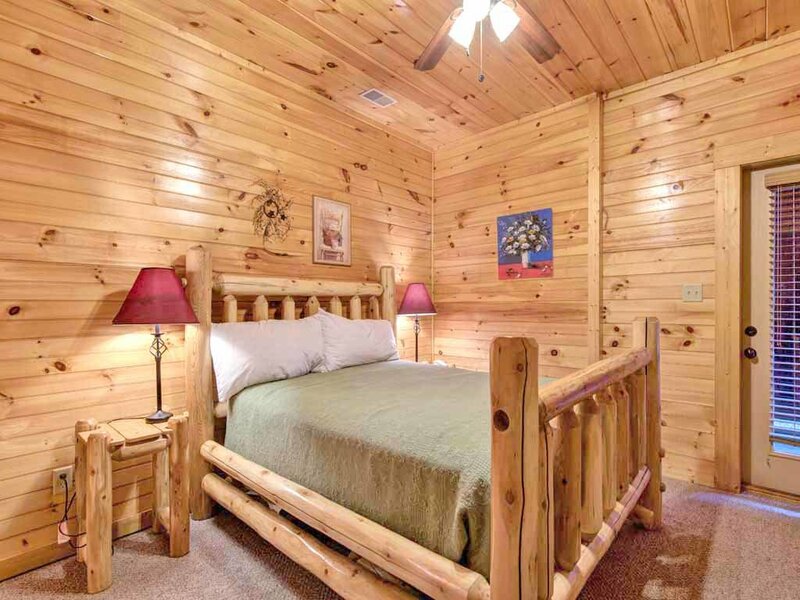 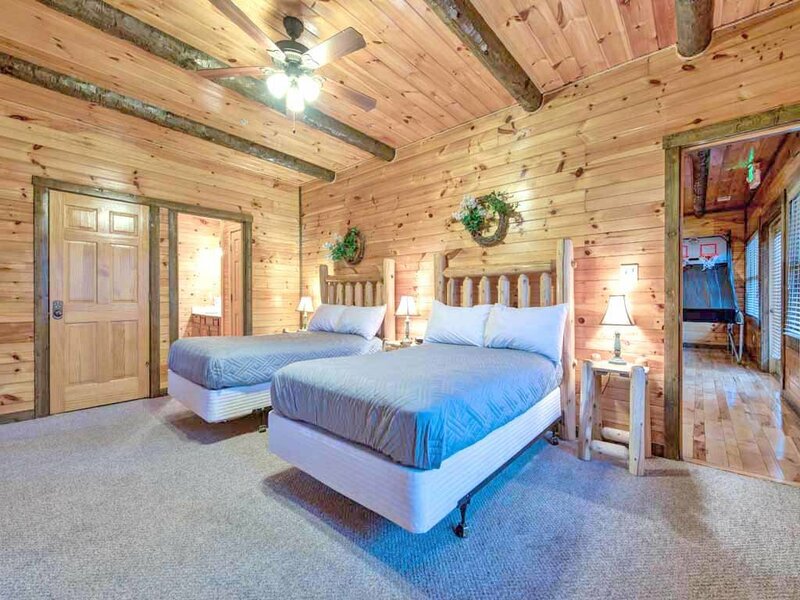 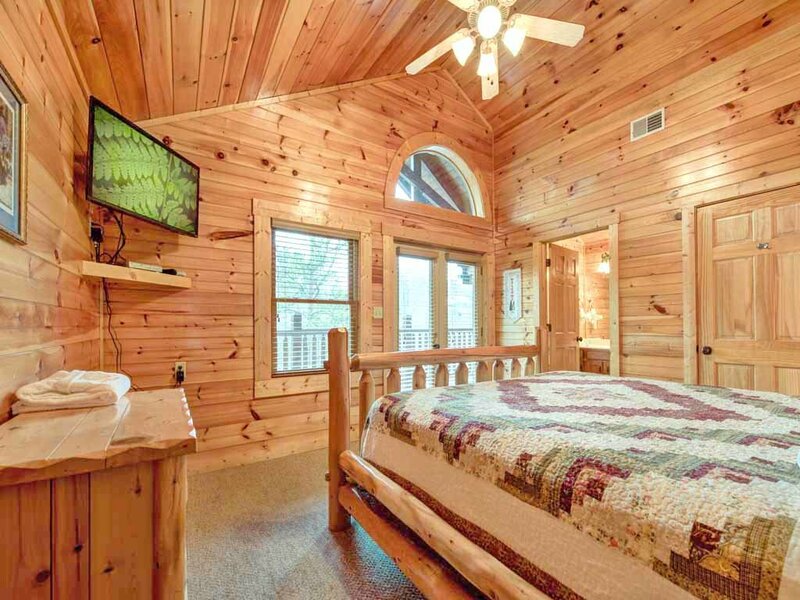 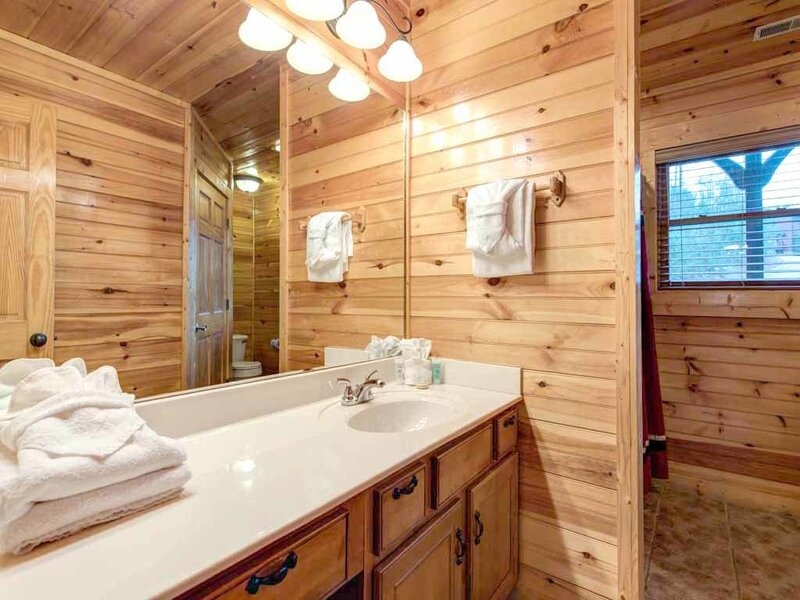 Whether you’re in town with a team that’s competing at nearby Rocky Top Sports World, hosting a family reunion, or on a trip with your church group, Pine Tree Lodge will meet your needs with comfort and style to spare. 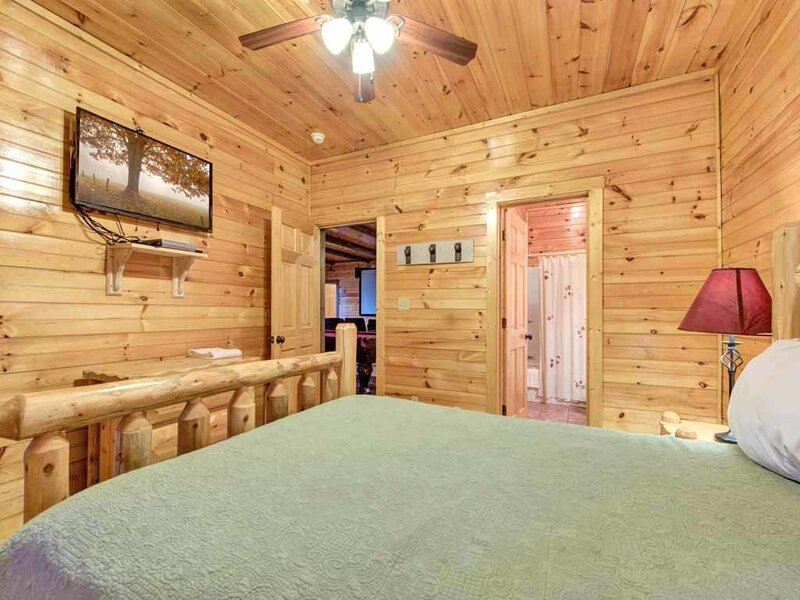 Not only does each of the eight bedrooms have its own bathroom, but each also has a flat-panel TV and direct access to one of the lodge’s three huge covered decks. 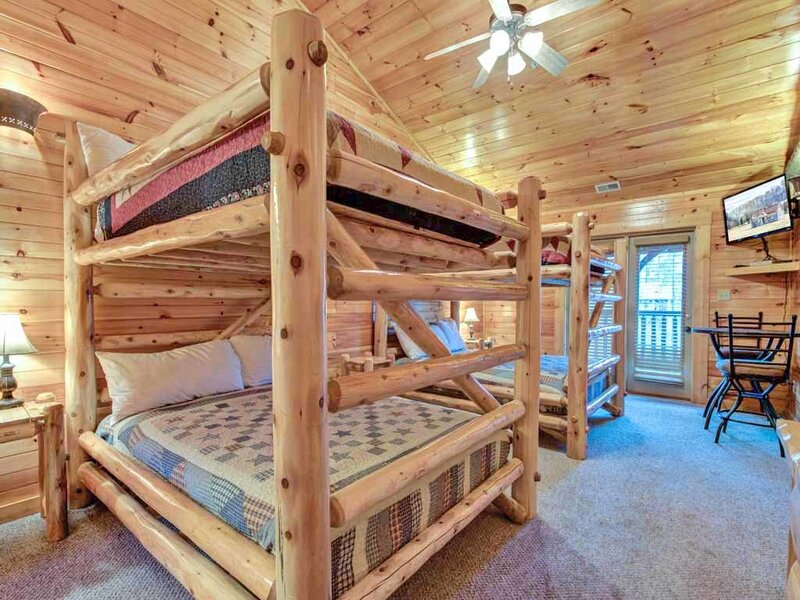 The top floor consists of four bedrooms; two have a king-size bed, while each of the other two sleeps eight in a pair of queen-size bunk beds. 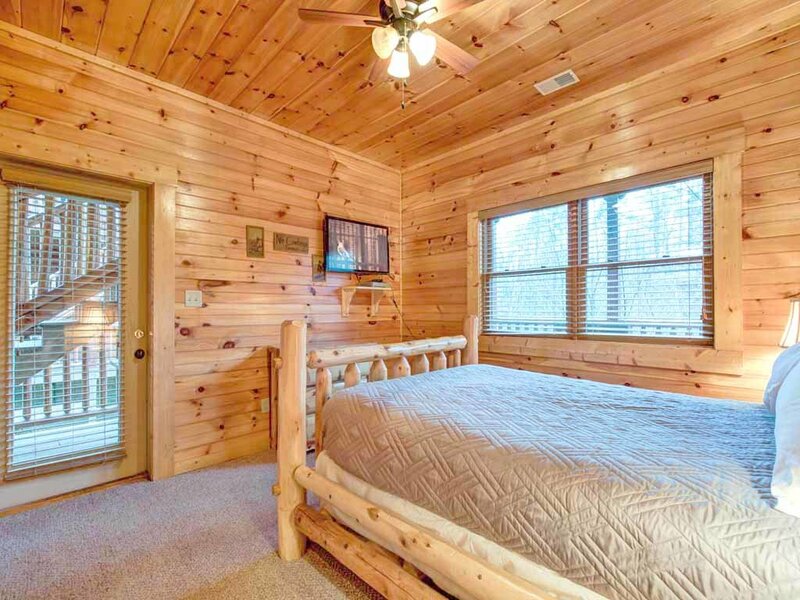 The master bedroom is on the main floor. 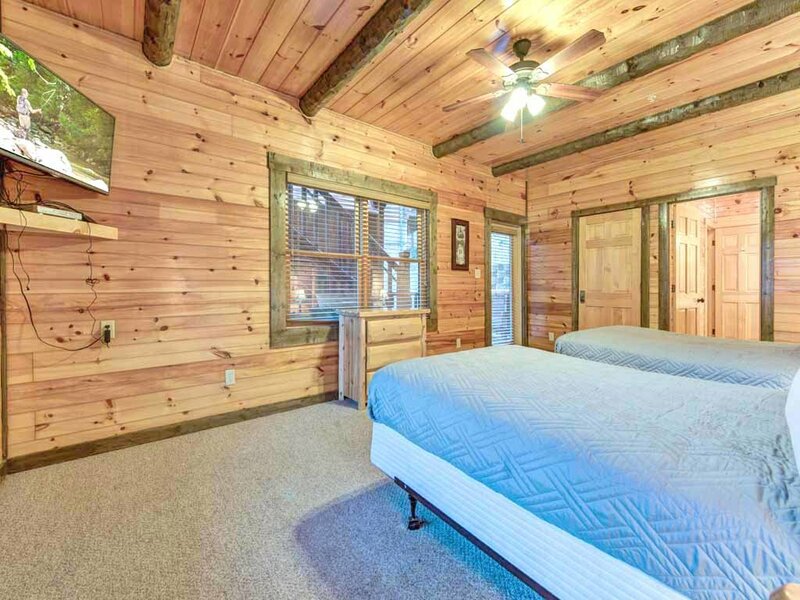 In addition to a king-size bed, this room has its own fireplace and a sofa that opens into a queen-size bed, so that four people can sleep here. 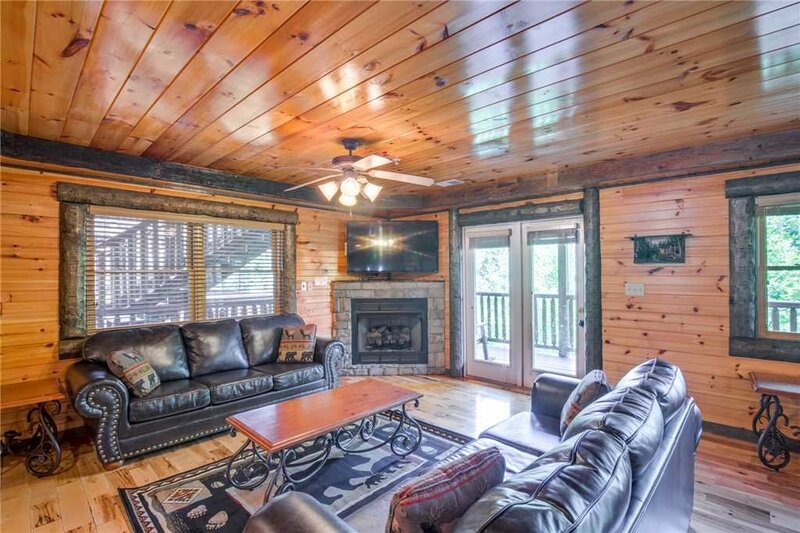 The three sofas in the floor’s two living rooms (that’s right, Pine Tree Lodge has not one but two living rooms) also open into queen-size beds, accommodating another six guests. 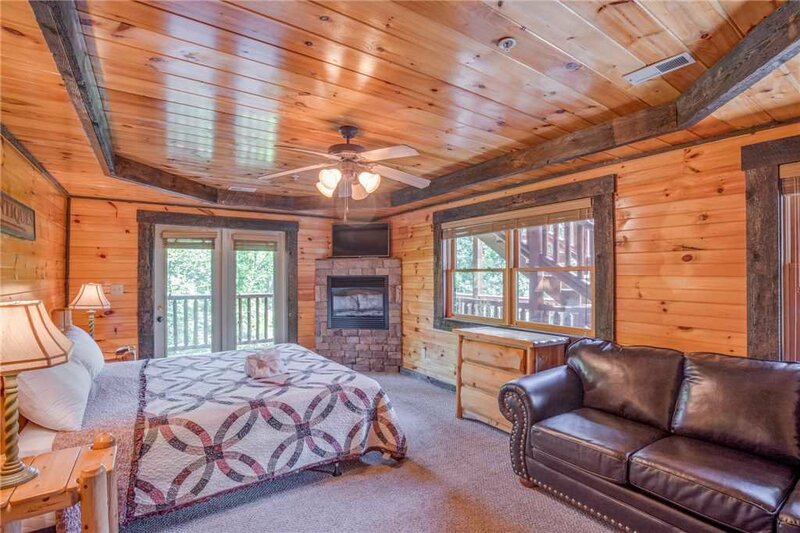 The remaining three bedrooms are downstairs. 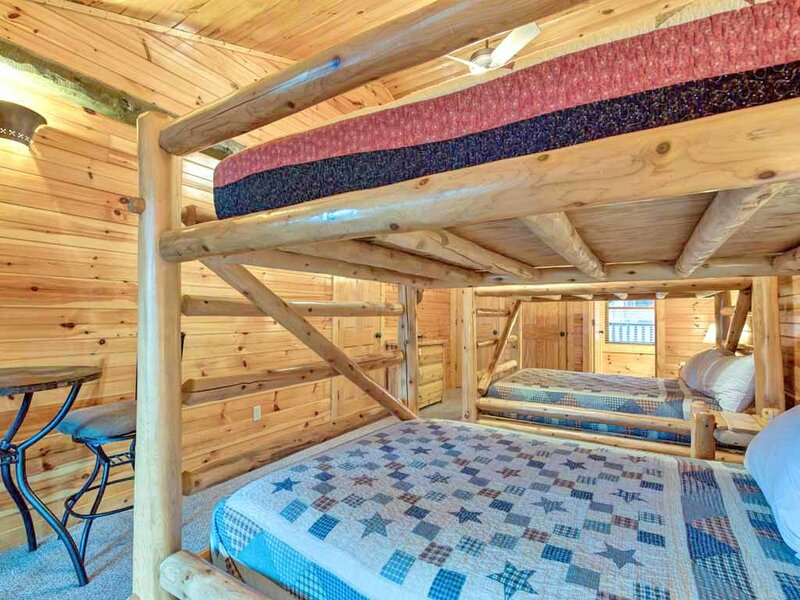 Two of these bedrooms have a queen-size bed, and the third includes two full-size beds, so that it can sleep four people. 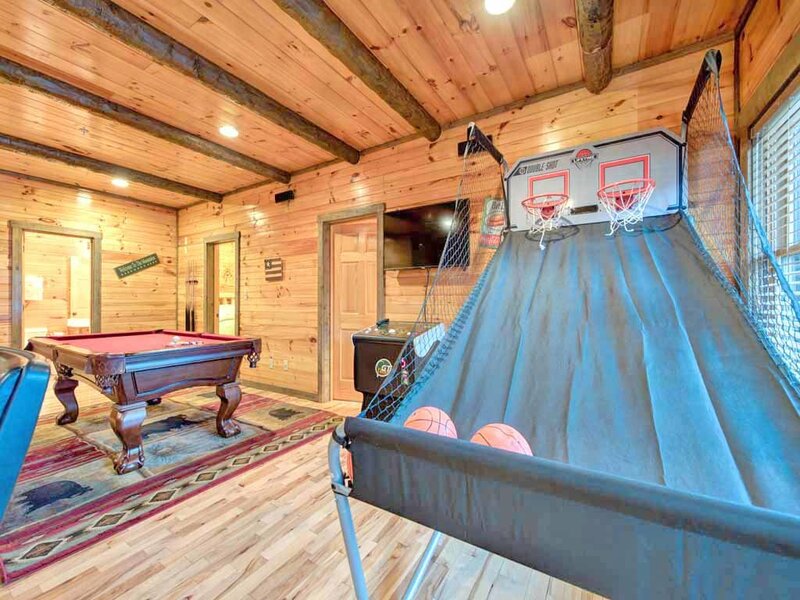 In addition to three bedrooms, the lower level is home to the spacious game room. 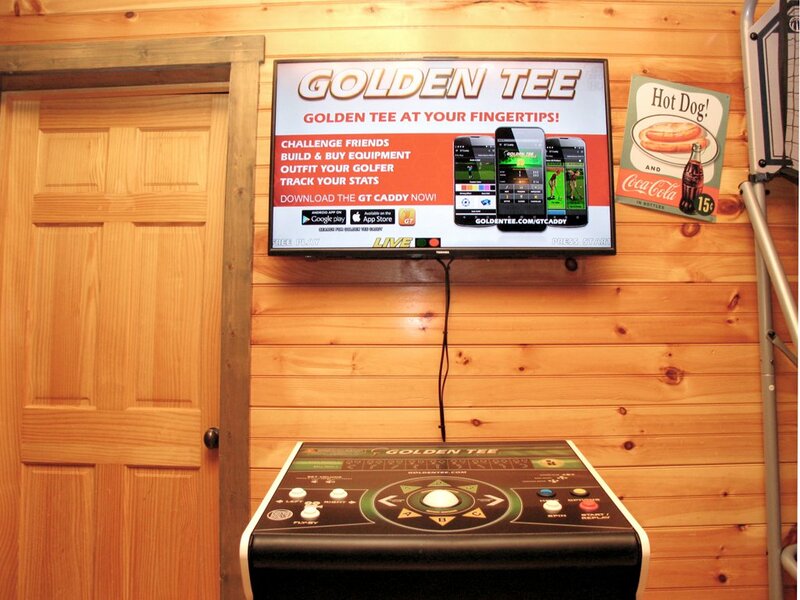 There really is something to keep everyone entertained down here: a pool table, for starters, plus a double shooter basketball game and a Golden Tee golf arcade game. 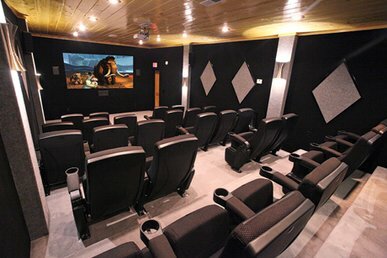 A home theater makes up part of the room. 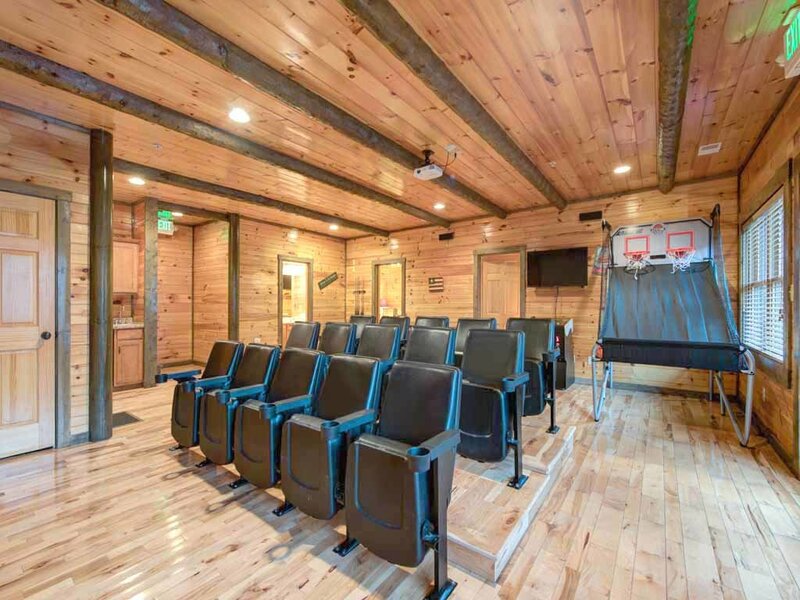 Guests can kick back in the fifteen cinema-style seats and watch a movie or a big sporting event on a 110” projection screen. 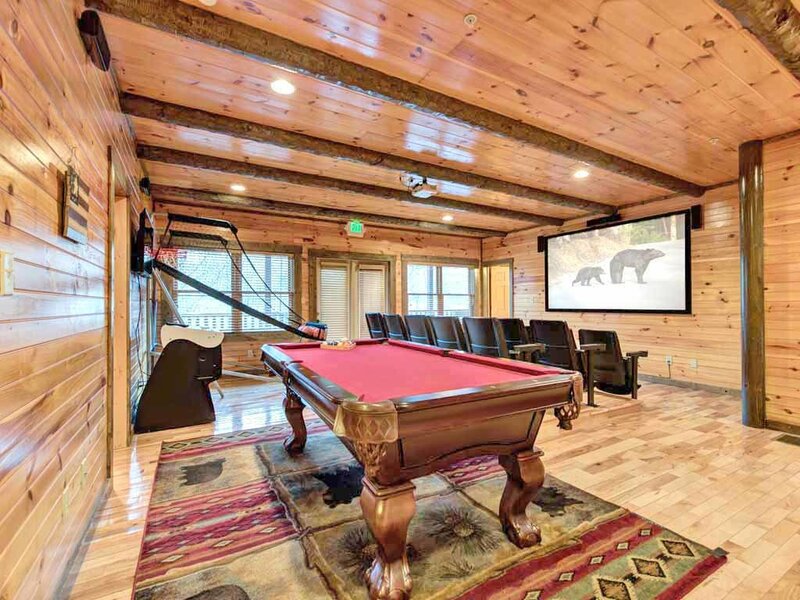 If you run out of snacks or beverages during your private screening, you don’t have to head upstairs to the kitchen—the game room has a convenient wet bar. 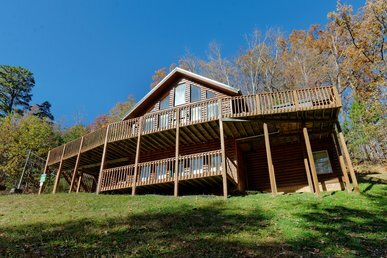 Up one flight, on the main floor, are the two living rooms, the dining area, and the kitchen. 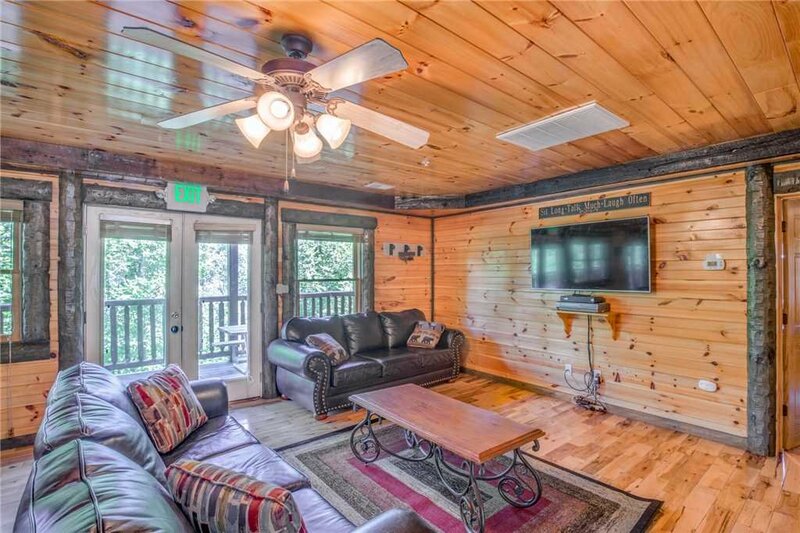 Both living rooms have so-comfortable leather sofas that you can pile onto to watch a favorite show on the large flat-screen TVs. 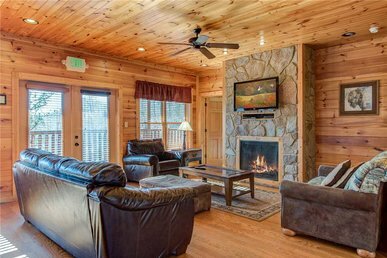 One of the living rooms has a fireplace as well, making it an especially welcoming space for relaxing after a day of skiing or snowshoeing. 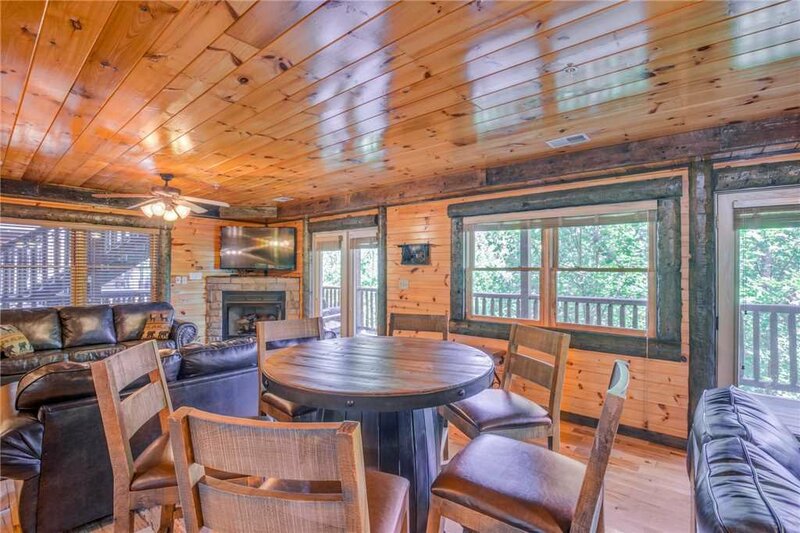 There’s a large card table too, where you can play board games or set up your laptop to take advantage of Pine Tree Lodge’s free WiFi. 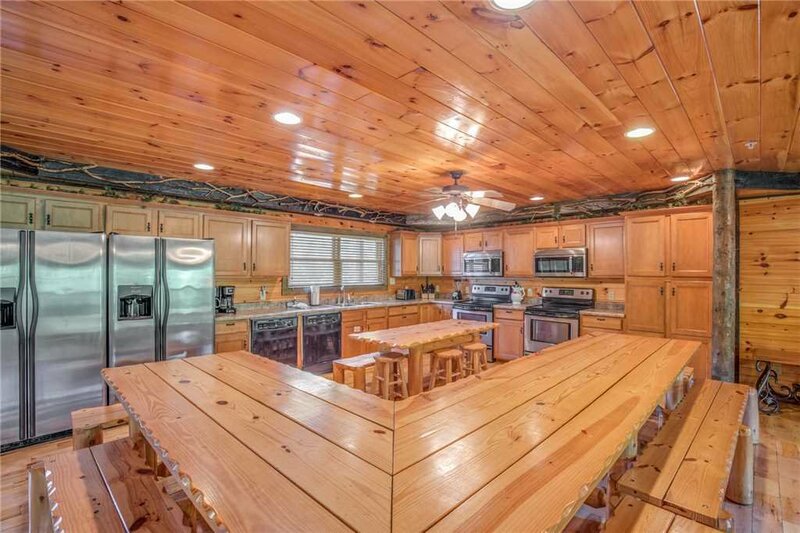 Don’t you hate when a house that can sleep several dozen people has a dining room that can seat only a handful? 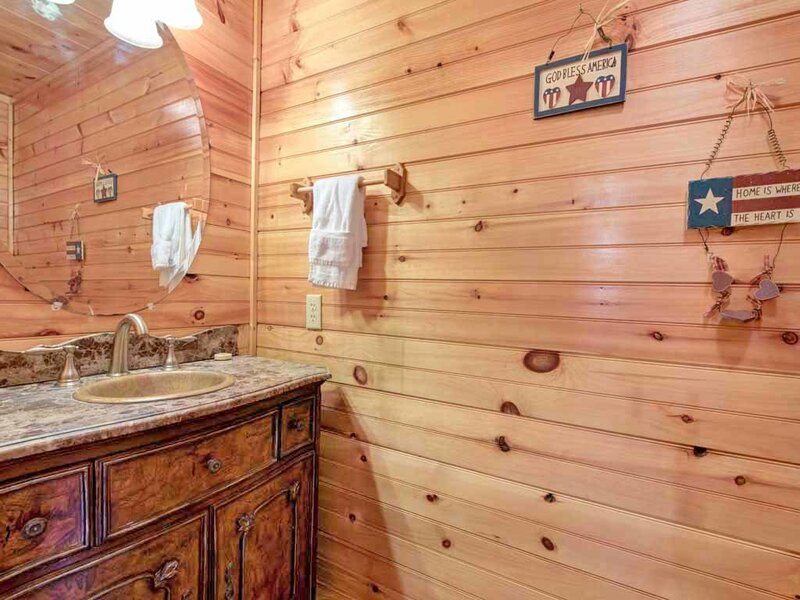 That’s definitely not the case at Pine Tree Lodge. 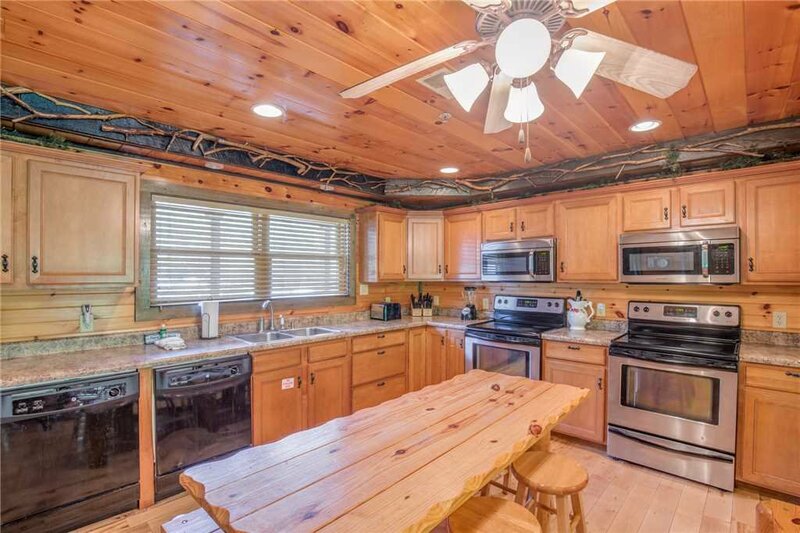 The whole gang can gather at the huge L-shape, log-style dining table, and if that feels a little crowded, at least six people can sit at the neighboring kitchen island. 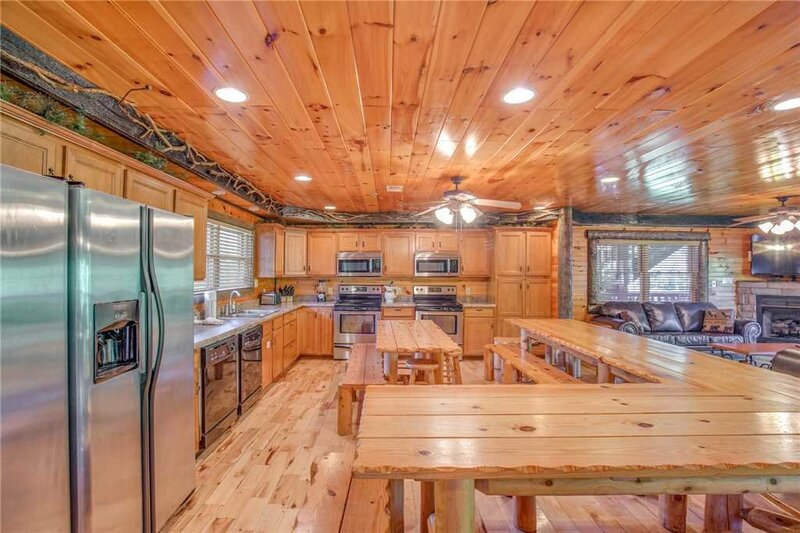 The kitchen, too, is designed to feed the entire group at once. 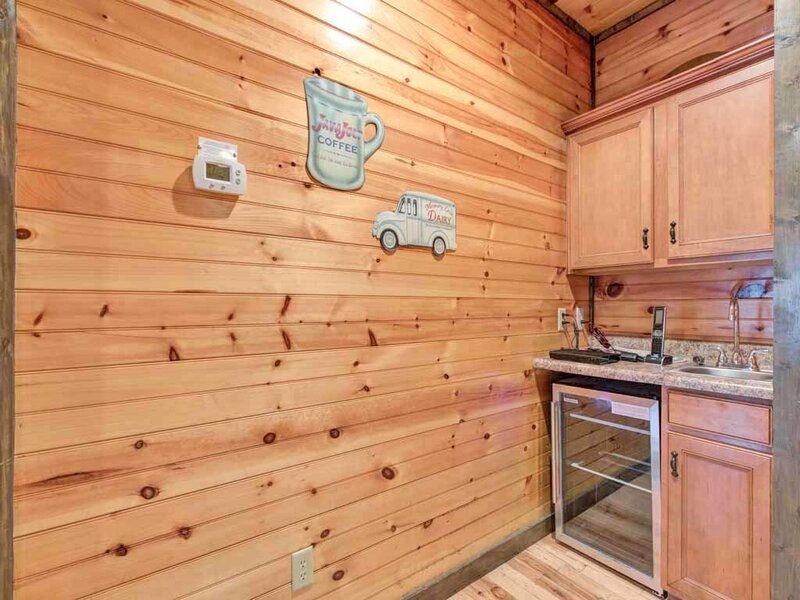 It’s equipped with two large refrigerator/freezers, two full-size oven/stoves, two microwaves, and even two dishwashers. 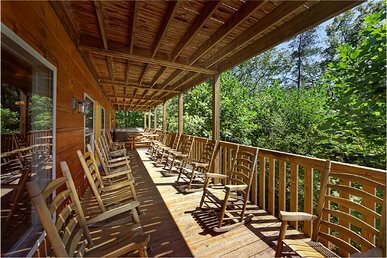 Pine Tree Lodge’s three decks are also large enough to accommodate a crowd, with plenty of rocking chairs so that everyone can revel in the crisp mountain breeze, the singing of chickadees and larks during the day, and the chirruping of crickets and tree frogs at night. 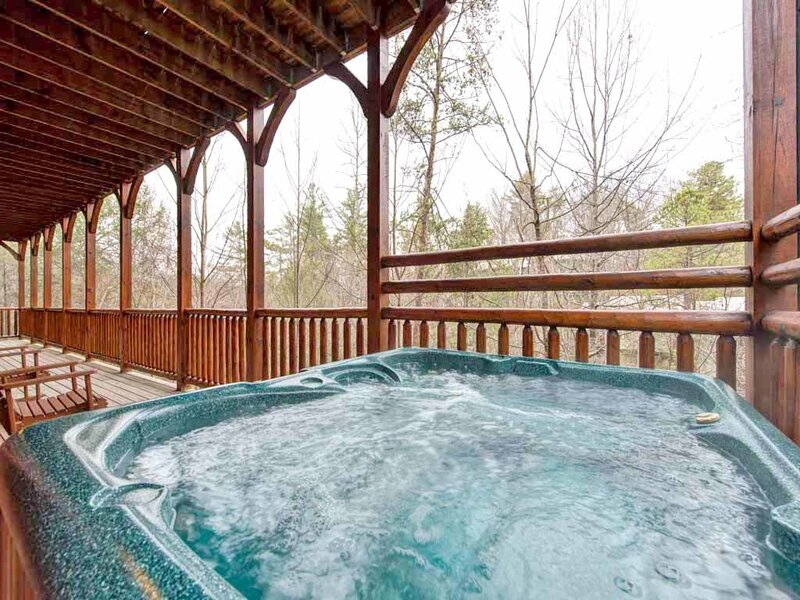 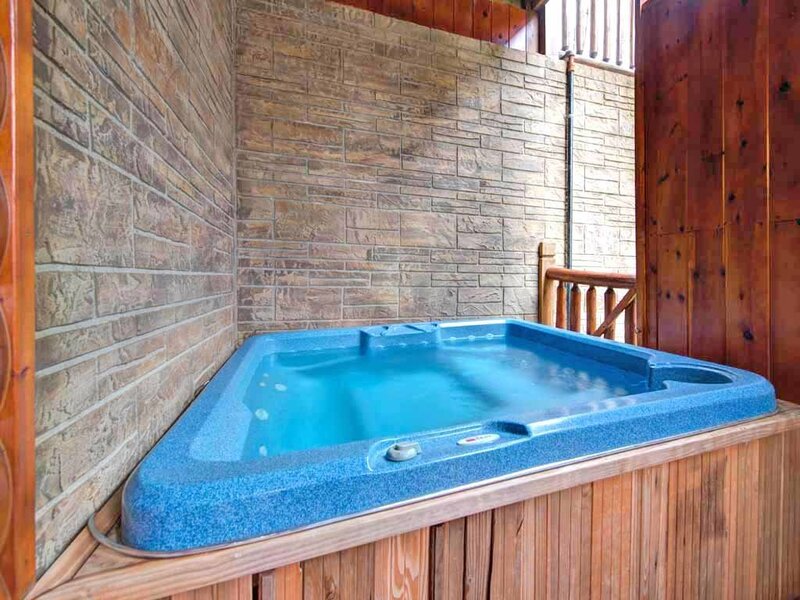 Likewise, the two hot tubs ensure that everyone gets a chance to luxuriate among the steamy, rejuvenating jets of water. 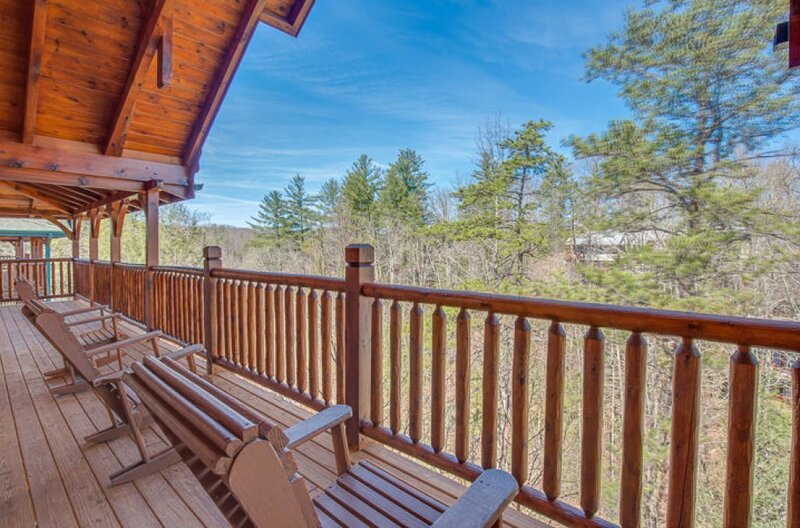 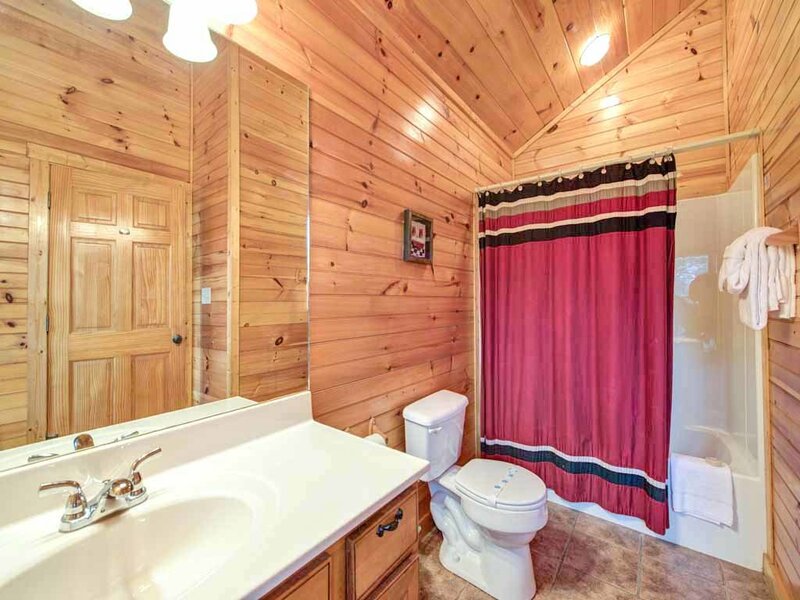 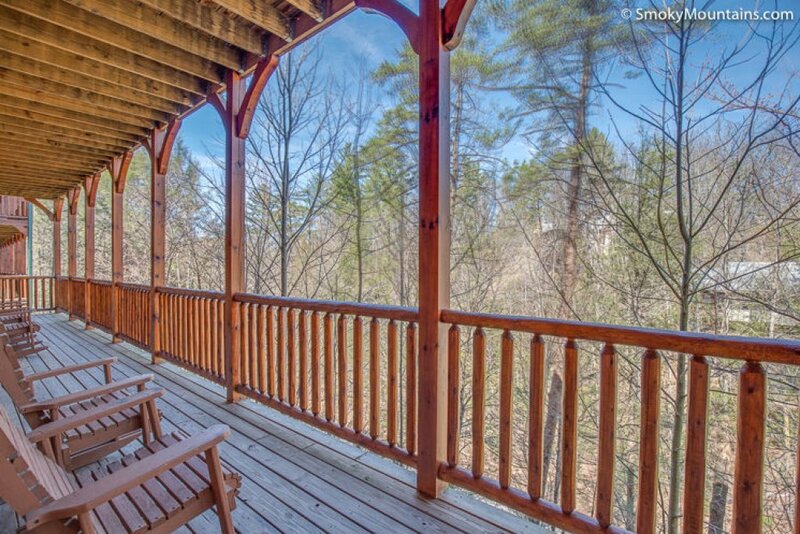 The lodge is located in the Hemlock Hills development, which is as quiet as it is conveniently located. 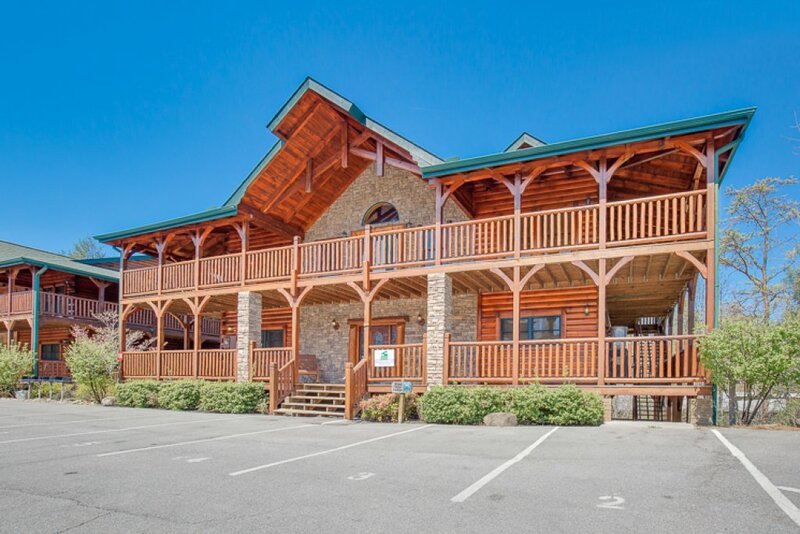 Rocky Top Sports World is less than a mile away; so is the Gatlinburg Arts & Crafts Loop. 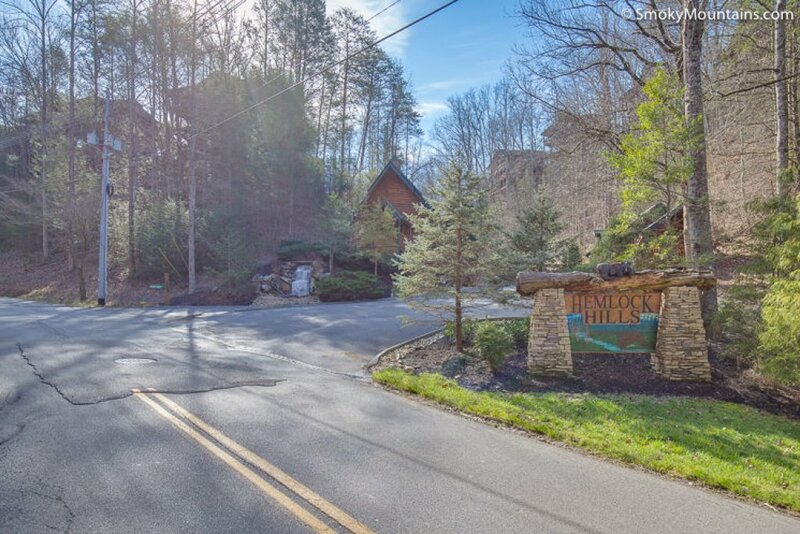 Less than fifteen minutes away is downtown Gatlinburg, home to the Guinness World Records Museum, an aquarium, mini golf, and the tram that travels above the town to Ober Gatlinburg Ski Area and Amusement Park. 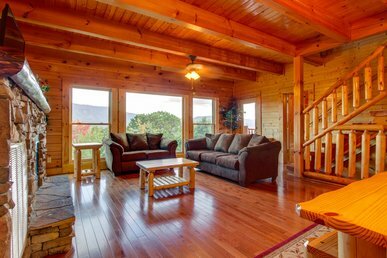 Finding a rental to accommodate more than three dozen people can be a challenge, but Pine Tree Lodge more than rises to it. 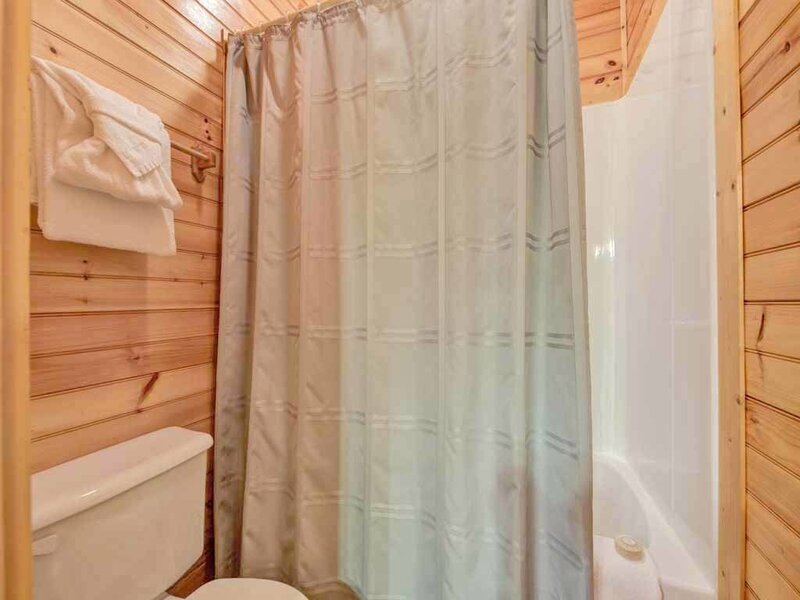 So book your stay today and get ready to be showered with praise by the rest of your group.